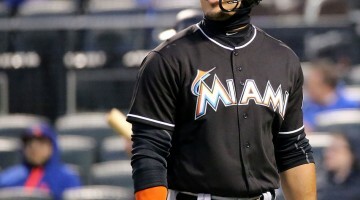 MIAMI (AP) – Reacting to the Giancarlo Stanton trade, a Miami Marlins supporter who is a priest suggested in church that fans boycott the team’s games in protest. DOES DEREK JETER HAVE A PRAYER? 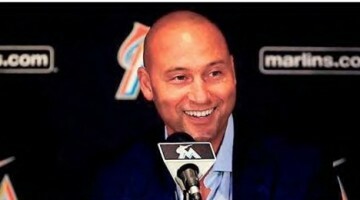 Always a winner as captain of the New York Yankees, Jeter is now trying to revive the downtrodden Marlins, and so far he appears out of his league as a CEO. Barely two months into the job, he has been faulted for his handling of the Stanton deal, and that’s not all. Critics contend Jeter is to blame for clumsy firings, delegating too much and hanging in the background rather than accepting his role as the face and voice of the franchise. And long-suffering Marlins fans wonder: If Jeter’s ownership group didn’t have enough money to pay Stanton, why did they buy the team? Jeter thrived in New York, somehow retaining an impeccable image amid the scrutiny of the world’s media capital. The theme at his retirement celebration was respect — the logo was “re2pect,” with Jeter’s jersey number replacing the S.
Now that he’s a novice baseball executive in Miami, the glare’s not as bright but the glow is gone, and re2pect must be earned anew. Part of the issue is that Jeter has taken on a task that may be impossible — trying to make baseball succeed in South Florida. 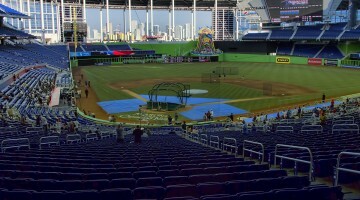 The Marlins’ miserable record and attendance year after year has raised doubts about whether the sport belongs in the Sunshine State. Founding owner Wayne Huizenga drew boos at the ballpark despite the Marlins winning a World Series title in 1997. Jeffrey Loria, who sold the team to Jeter’s group, became wildly unpopular even after his Marlins made a storybook run to another championship in 2003. And now it’s Jeter drawing jeers when he attended a recent Miami Heat game. He also sat in a skybox at Monday night’s DolphinsPatriots game, raising the question: Why wasn’t he at this week’s winter meetings? But his absence reinforces the notion he’s trying to distance himself from the decisions he’s making. Even before Jeter’s group formally took over, the Marlins fired Jack McKeon, Jeff Conine, Andre Dawson and Tony Perez, all longtime executives and team ambassadors. There was public backlash, and another when the Marlins fired popular TV play-by-play announcer Rich Waltz. More negative headlines reported the Marlins fired a scout while he was in the hospital recovering from cancer surgery. Jeter has said little in response to the criticism. “It has been a learning experience,” Jeter said. “There have been a lot of stories out there that haven’t entirely been true. But now the media and fans have turned on Jeter.